A Reagan-era fever dream inspired by hazy childhood memories of midnight movies and Saturday morning cartoons. 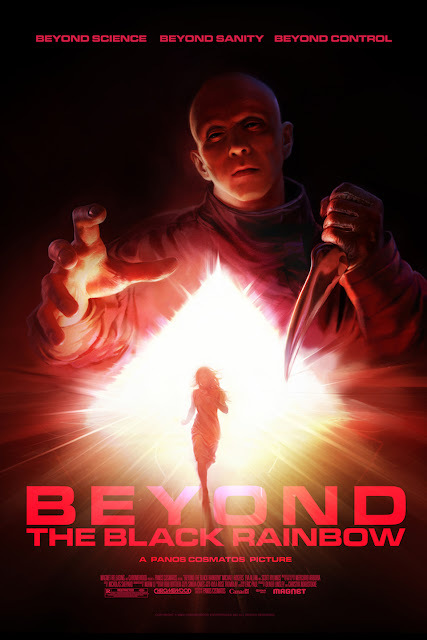 Beyond the Black Rainbow is the debut feature film from Canadian writer and director Panos Cosmatos. It premiered at the 2010 Whistler Film Festival, only just recently getting a limited theatrical release following it's popular screening at the 2011 Tribeca Film Festival. A glacial, atmospheric, dreamlike, sci-fi horror head trip, heavily inspired by all those late 70s/early 80s films which more often than not, failed to live up to the expectations promised by their glorious posters and box-covers. Cosmatos takes his fascination with those films to a mesmerizing place. A confusing yet brilliantly crafted locale, assembled from broken shards and partial memories of an era gone by. The setting is a new age facility, where a young girl named Elena (Eva Allan) with supernatural abilities is being held captive as a subject for sadistic experiments performed by the ever so sinister Dr. Barry Nyle (Michael Rogers). The story however, takes a back seat to the dark dystopian mood, futuristic sets, and colorful slow moving camera work. Displaying the clinical future world that we all imagined 2012 would be like 30 years ago, complete with analog wall-screens, back-lit buttons, and sliding doors. The film is a sensory explosion (as you can see from the trailer), combining heightened visuals (lensed masterfully by Norm Li) that resemble 2001: A Space Odyssey if it were shot by Dario Argento, and a pulsing synthesized soundtrack (composed by Sinoia Caves aka Jeremy Schmidt) that sounds somewhere between John Carpenter and Wendy Carlos, to deliver a mind altering cinematic experience. Acting is also captivating in a strange way. There's very little dialogue, and what is said is almost all irrelevant, but Rogers (who looks like he could be the evil brother of Christian Bale) delivers his lines with a disturbing unnatural cadence and an eerie intimidating glare. It could have easily been, but thankfully manages to avoid being, just another tasteless mash-up of pop culture references. Cosmatos may borrow generously from the familiar, but the result is all his own. A marvelously hallucinogenic voyage that extracts the elements of Sci-Fi down to it's most basic roots of imagination. Somewhat like what Hélène Cattet and Bruno Forzani did to distill and celebrate the sensual essence of giallo with Amer, though I have to admit, not quite as successfully. As much as I was impressed by most of this film, it has a disappointing last five minutes, not enough to totally ruin the film, but enough to hold it back from being an instant classic. As it is, this is a film that will only appeal to a very limited audience. In my estimation, an extremely patient and open minded viewer who neither demands nor requires traditional explanations or conventional narratives. In addition to having a slightly nostalgic love for the VHS era. Much like the director, I also grew up during the 1980s, and was never allowed to watch all those cool looking R-rated films with the thrilling artwork and enticing descriptions. So inevitably I've grown up with the same fondness for them. A stunning debut and an unabashed tribute to an era gone by. Beyond the Black Rainbow, takes us on a kaleidoscopic slow ride through the inspired imagination of Panos Cosmatos. It's imperfect, but it's daring. A rare labor of love created without compromise. As such, most will hate it, but those willing to kick back and fall into its hypnotic rhythm will be rewarded with one of the most captivating cult films in recent memory. I can't wait to see what he comes up with next. Looks frightening but stunning, I might even brave this one!! I've never heard of this one but will keep it in mind! It looks very good! Very Kubrickian with the overuse of the reds and the unhealthy cleanliness of the sets! I was getting a distinct 'THX-1138' vibe from the clip. Though creepier. Soundtrack sounds very 'Tangerine Dream'. Good to see we couldn't disagree more on this one! This has been getting such a lot of buzz everywhere I see, but I was distinctly underwhelmed when I saw it last year. I actually liked the more experimental parts and the visual/auditory experience those provided, but every time it tried to have an actual story, it was just awkward and boring, and I really disliked it. And you're right, the ending didn't do it any favors, especially when I was already over what the movie was trying to do. I haven't the slightest idea if this will be for me, but it intrigues me enough to try. Honestly it's been a while since I've seen a good sci-fi movie, and if I end up liking this it'll be exactly what I need. Visually stunning to say the least. I'm ready to jump in to this film and love it. Whether I can or not is another matter from teh sounds of it. This sounds (and looks) intriguing! The screenshots remind me a bit of Amer, which took its inspiration from the films of the 70s, specifically Giallo. We will definitely be seeing this one! There's not a lot of horror in it, I think you could handle this. Yep very Kubrickian, and I like that term 'unhealthy cleanliness'. Yes there is most certainly a bit of THX-1138 in the visuals and dystopian tone. I think you would like this one JD. It's way better than Prometheus. Yeah, hard to say whether you will like this or not. Looking at RT and IMDb, this one seems to be hated by many and loved by few. Seems the Letterboxd crowd is generally in favor though. Yes, this reminded me of Amer as well, not in subject matter, but in how they both accurately capture the feel of the movies they are inspired by. Thanks for stopping by GG, I look forward to checking out your review. I'm not sure if it's to my liking, but it looks exceptionally interesting, just as all the films that you recommend. No worries, thanks for taking the time to visit Lesya. It was a brilliant movie. Initially, I found it hard to follow since it's a very loose narrative but it quickly became apparent that the story is not the point. The nightmarish mood steadily continues til the underwhelming end. It honestly feels like a fever dream captured on film. 'Unhealthy cleanliness' is a perfect term. You really get bewitched by the visuals and sound. To me, it was much more successful than the pretentious video work of artists like Matthew Barney because I didn't feel like Cosmatos was trying to make some kind of 'statement'. It's no surprise that he has previously worked in the realm of music videos. I recommend it to anyone who is interested in the visual/audio aspects of film-making. Sorry everyone, a long review! No apologies necessary, thank you for stopping by and leaving your remarks Josh, I'm glad you found it as mesmerizing as I did. This played at a great, local theater at midnight a couple weekends back but I missed it. :( I'm still really looking forward to seeing it. Really good review. Though I think this one is better seen on the big screen, I think I heard that the DVD/Bluray is coming next month. So you should get another chance to see it soon.